Essar Oil & Gas Exploration & Production (EOGEPL), the exploration & production (E&P) arm of Essar group, is likely to invest $1 billion (Rs 7,400 crore) for shale gas exploration in West Bengal in the next few years if the findings become encouraging. Essar along with Great Eastern Energy of Y K Modi group has already sought permission for shale gas exploration in its coal bed methane (CBM) mines in the state. The Centre has permitted exploration and exploitation of all types of hydrocarbons, including shale resources under the existing CBM contracts, via a notification on July 24. Vilas Tawde, MD & CEO, Essar Oil & Gas Exploration & Production, told TOI that in the Indian energy sector, Essar is focusing on its E&P business with a strategy of investing in coal-bed methane (CBM), as well as shale gas. “We have found very promising shale in-place reserves of 8 tcf (trillion cubic feet). The recoverable reserves are of 1.6 tcf in the Raniganj East block, which is also among India’s highest producing CBM blocks with a production of one million standard cubic metres per day (mmscmd),” he added. 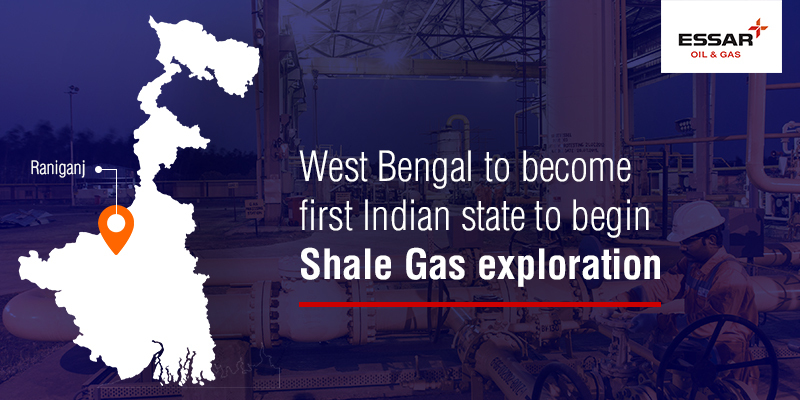 Tawde added that with plans to begin test exploration, Bengal will become the first state to set off India’s quest for shale gas. “Over the next couple of years, EOGEPL plans to drill a few exploratory and horizontal shale test wells at an expected budget of $30 million. If these test wells are successful, the total investment, including post development and production, will be to the tune of $1 billion,” he said. EOGEPL has commenced supplies of CBM gas from the Raniganj East block to GAIL in accordance with a 15-year supply contract that it recently signed with the PSU for offtake of its entire production from the block. Saleable gas volume of up to one mmscmd would be achieved by March 2019. With further ramp-up, 1.7 mmscmd and 2 mmscmd of production are targeted by March 2020 and March 2021, respectively. According to him, the CBM development plan for the Raniganj East block envisages drilling of 500 wells, of which 348 have already been drilled at an investment of Rs 4,000 crore, which includes an equity of Rs 2,700 crore. “Drilling the remaining 152 wells will require an additional investment of Rs 1,000 crore. Once all the wells are developed, the production from the block will peak at 2.6 mms cmd. Of this, 2.3 mmscmd will be saleable,” he said. The eastern region has a huge potential of shale gas as most of the CBM reserves is located here. The estimated shale gas reserve in the region is up to 96 trillion cubic feet (tcf). DGH officials had said that there is wide variance in the estimation of shale gas. Like in east, the estimate is 6 to 96 tcf.